When complete these scenes can either be free-standing or hung using the ring included in the kits. This is a companion piece to The Night before Christmas and shows a fireside on Christmas Day, with a cosy wood burner and a glittering tree. A snowy garden is glimpsed through the window. It stands 11.5 high. 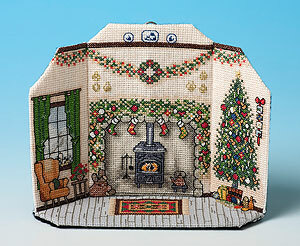 Kit contains 18-count aida, felt, pre cut plastic canvas pieces, stranded thread, needle, chart and full instructions.